In addition to being tremendously successful at the box office, Black Panther continues to get plenty of attention during awards season. After competing for Best Picture - Drama at the Golden Globes, the Marvel movie is now up for Best Picture at the 91st Academy Awards, making it the first superhero movie to receive the honor. Directed by Ryan Coogler, the movie will be competing against some other strong titles, going against BlacKkKlansman, Bohemian Rhapsody, The Favourite, Green Book, Roma, A Star Is Born, and Vice. Facing such heavy competition, it's certainly hard to say if Black Panther can pull off the win, though it's certainly possible. At the Golden Globes, competitors Bohemian Rhapsody took the prize. At the event, Black Panther is also up for six other Oscars. The other nominations for the movie are for Best Costume Design, Best Sound Mixing, Best Sound Editing, Best Original Score, Best Production Design, and Best Original Song. The last time a superhero had received so many nominations for a single movie in one year was for The Dark Knight, which had eight overall. Ultimately, that movie would win two Academy Awards, with Best Supporting Actor posthumously awarded to Heath Ledger for his role as the Joker. The Dark Knight also won the award for Best Sound Editing, which Black Panther is also up for this year. Starring Chadwick Boseman, Black Panther is based on the Marvel superhero of the same name. It's the 18th installment in the Marvel Cinematic Universe, but it's considered by many to be one of the best of them all. It was clear early on that the movie would make for a strong contender at awards season due to its reception. 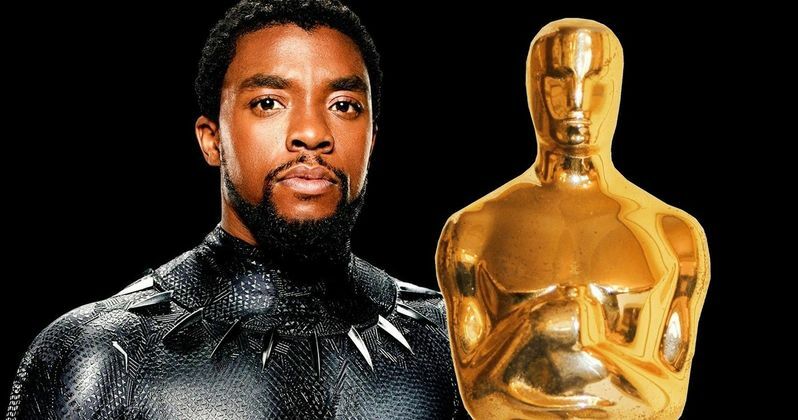 As potentially the first superhero movie to ever grab a Best Picture Oscar, Black Panther also received plenty of recognition at the Golden Globe Awards, the Screen Actors Guild Awards, and the Critics' Choice Awards. The movie currently has a sequel in development, with Ryan Coogler returning to write and direct. Coogler has suggested that he'd love to explore T'Challa's reign as king in future movies, but details on the upcoming movie's story aren't yet clear. Joining Chadwick Boseman reprising his lead role is Letitia Wright, reprising the role of Shuri. There's no official release date attached to the project, but time will tell if the follow-up can manage to reach the same heights of the original, or maybe even surpass them. Not every superhero movie can be recognized at awards season, but the success of Black Panther still helps the entire genre. Superhero movies are taken much more seriously these days than they were in years past, and they only seem to just get more and more successful. Don't expect to see an end to new titles from Marvel and DC hitting theaters anytime soon. As for what's next for T'Challa, fans will be able to see him again when Avengers: Endgame premieres in theaters on April 26. This information comes to us from Variety.